It’s a game with a medieval/king’s court kind of vibe. The queen is the star, appearing as a wild on the reels, but most of the time you will see images of two knights which end up fighting each other, or various shields with heraldry on them (logos with red roses, lions, rams). There will be four card suits as well. Play n GO has become one of the favorite developers, for a lot of players. Not only are their slot machines very well designed, but they can also be fun to play, they pay well, have good RTP and often enough there are unique or rare features introduced as well. Queen’s Day Tilt is a pretty good example of that, actually. Look for the betting options at the bottom of the reels. You will find a horizontal row of betting options there, which start from a minimum of $0.10 and can reach a maximum of $100. This covers all possible wins, and the paytable will mention how much you can win for the current wager, in each combo. The game is not quite a 3-reel classic, even though it may seem like so at first. There are 3×3 reels to play on, and to create a winning combo you need 2 or more symbols which match. These symbols have to appear next to each other, either on a vertical or horizontal row. Going by this, it appears to have the equivalent of 6 paylines (3 horizontal rows and 3 vertical columns). One of the interesting things about this game, besides the possibility to have wins with 2+ matching symbols next to each other, is the fact that the ones involved in winning combinations are removed from the reels. There are no new symbols coming in, but the ones from the top can fall down, and contribute to a new combo forming. The Ruler is an event which can occur at random, during non-winning rounds. A wild is placed on the reels, and it is pretty much guaranteed to pay you (you only need 2 symbols to get paid, the wild and whatever other icons are next to it). This event is guaranteed for non-winning free spins. Tilt is another one that you may get at random, and it is offered if only one symbol remains, after all the others get removed as they form combinations. That last icon is then also removed, and the free spins may begin. The Game of Accession is a free round, which you are offered when you have wins with both high paying symbols, the ones with the Knights. You predict which one will win, and the one with the most winning symbols is the victor. 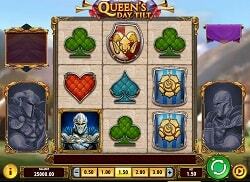 The regular Queen’s Day Free Spins are activated when you manage to clear the grid completely, of regular symbols. This can be done via several winning combinations, which remove the symbols involved. You get 5 free spins and a multiplier which starts at 2x and goes up whenever both Knights form combinations. Thanks to the win multipliers available during free spins, Queen’s Day Tilt can end up paying a considerable amount, with the top potential being 5,000x the stake. At the highest wager, it will have a top jackpot of $500,000. The Return to Player is at 96.36%, which is a good number to be looking at, definitely above average for a slot machine. You get a 3-reel slot that’s definitely not a classic release, with big payouts, good RTP and enough unique features, so it’s one of the many exciting games we’ve seen Play n GO launch over the years.